Where I was 11 years ago is less important to me than the overwhelming sense of rage the day engendered. I recall I skipped my run that day in Richmond, VA. Just miles down the road from the Pentagon and all I could think was, “I should be there. I should be doing something.” Instead, I sat there, glued to the television like the rest of the world, watching those horrible images cascade across the screen until I was numb. When the cell networks finally became available, I called my family to let them knew I was alright – all they knew is that I was on a trip to Virginia. 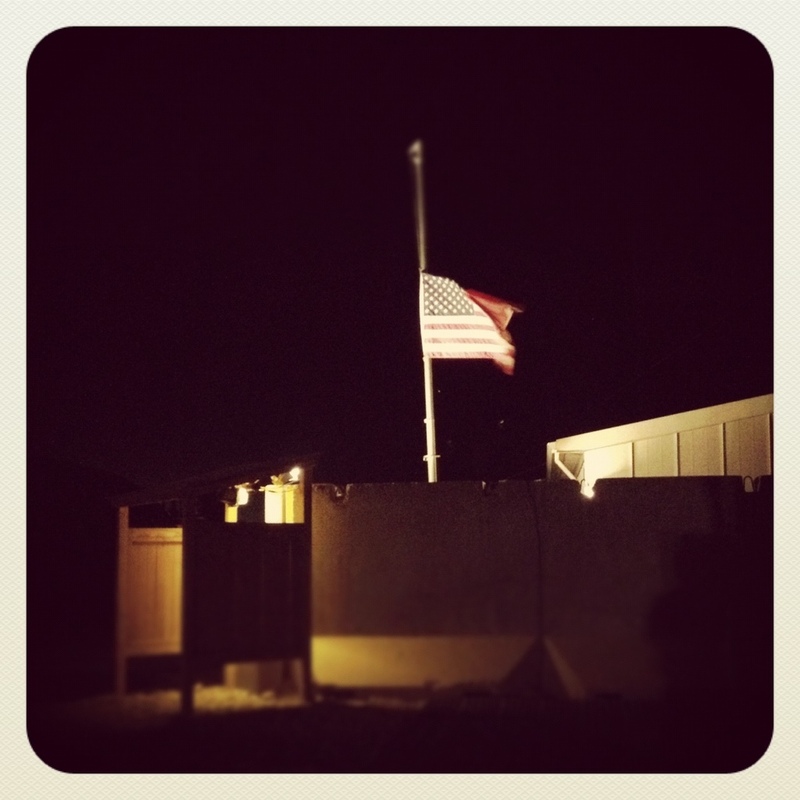 One year later, I found myself marking the anniversary September 11th in Afghanistan, at Bagram Air Base. It was different time back then, a different war. Every American on base lined up in front of the CJTF-180 headquarters, known as “The Death Star” for its domed, pressurized structure. There were some media hanging around, and I recall it was a hot, dusty, busy day. This was long before counterinsurgency became the catch phrase of defense literati across the globe; before we paved roads, erected Pizza Huts, and sequestered ourselves inside impenetrable fortresses made of concertina wire and Hesco barriers. Before Iraq. Before we lost our way, and forgot lessons learned in the jungles of Southeast Asia. That day, watching our flag fly in a a foreign land was a watershed moment for me. Standing tall at countless formations, I’d never heard the national anthem the way I heard it that day. What I heard was a call to arms, a somber reflection, and an act of defiance. Fast forward 11 years, and here I am again. Serving abreast of men who watched 9-11 in high school, probably talked about it in between classes the next day; maybe even debated what it meant with a revisionist history or social studies teacher. Saddam is long dead. Osama, recently dead and gone. The 11th of September has come and gone enough times to have lost its meaning in a country more obsessed with escapism and thinks that a presidential nominee killed bin Laden. In eleven years, a lot has happened. Made rank, changed jobs, moved around, fell in love, married, got a dog and a house, moved to Alaska. Still, my feet lead me forward through the clarion call of what I heard back in 2002. We will falter. We will fail. But we’ll do it like we’ve always done; pick ourselves up, dust off our asses, and figure out how to do it better. Tonight, I’ll do the one thing that has stayed the same in 11 years of war. I’ll tie my shoes with a sigh, and get to stepping. Maybe even think a bit, try to figure out what it all means. Maybe, though, I’ll try to remember what it was like to watch those towers fall as a young lieutenant. Thank you for this post, Matt, and thank you for all that you have done and still do for me, my family, and my country.